Made of 50/50 poly-cotton blend, this generously cut deluxe jacket comes with a self-supporting domed veil. The veil is attached with a heavy-duty two-way cloth zipper that allows it to be easily removed. The collapsible veil does not need to be fully removed; it can also hang behind like a hood. 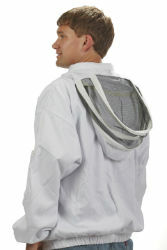 The jacket features a hook-and-loop patch at the front of the neck opening which secures the veil/jacket connection for extra protection from stray bees. Elastic wrist cuffs and waistband keep out the bees. It features four roomy front pockets that can hold our Little Giant® Bee Log or other items. On each sleeve there is an additional pocket which is the perfect size for a hive tool. A great alternative for someone who does not want to wear a full bee suit when inspecting hives.